I was stopped dead in my tracks when I saw the Chocolate Marshmallow flavor in the store. Usually I hear about the new flavors before I hit the store, so I felt like I had accidentally struck gold and bought a few. The image in the corner of the pack is of cute poofy marshmallows with a creamy chocolate sauce on top. I had visions of a creamy marshmallow fondant center, but I felt them suddenly crash when I read “marshmallow flavored chocolate” on the package. I suddenly felt very skeptical. I didn’t know what to make of these after reading the description. Will this simply be another Kiss that’s basically just like the others? Or will this be new and a really nice twist on the original? Only one way to find out! 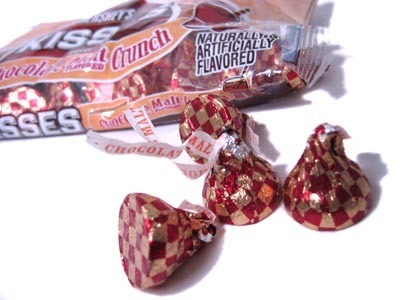 The Kisses come wrapped in silver and brown checkerboard patterned foil. They actually do smell of marshmallow: very sweet with strong essence of vanilla. Unwrapping the Kiss, it’s certainly of the molded variety with a very uniform, smooth and glossy finish. These babies are indeed solid, no creamy fondant center for me. The texture is more soft and creamy than a normal Kiss, which I usually find hard and gritty. The flavor is definitely different. It’s much sweeter and lighter, and has an airy vanilla taste to it. I didn’t think I’d be able to tell this apart from a normal Kiss, but since the vanilla is very noticeable and with the smooth mouth feel, I found myself wrong. I wouldn’t go out and buy these if you’re looking for something new just because they are so close to the original. But if you’re a die-hard Kiss-lover, you might consider checking these out. I love malt and I especially love malt and chocolate. I sincerely believe that this combination isn’t used to its full potential in the candy world, That’s why I was so excited when I found this new limited edition: Hershey Malt Kisses. Hurray! I was excited to get my malt fix in a form different from a malt ball. The package design is nice with a rich brown motif and with a malted milkshake next to the flavor name. It’s very cute. The smell of malt when you open the bag is just overpowering. Wow is it strong! It made me even more anxious to try these. The Kisses came tumbling out in attractive maroon and gold checked foil wrappers with the Kiss banners reading “Chocolate Malt.” As if the smell didn’t make it obvious enough! Oddly enough, once you have the unwrapped Kiss in hand, it smells like an ordinary Kiss. Thankfully the rich malt flavor come forth immediately once you have it slowly melting in your mouth. These are just wonderful. They have the malt flavor spot on, and mixed with the chocolate, it’s just heavenly. It tastes exactly like a very good malt ball except the texture is completely different – they added some nonpareils in there for added crunch, which I wasn’t expecting. I was pleasantly surprised though, because that texture became suddenly like the texture when you’ve finished a malt ball… smooth chocolate with the remaining bit of the malt interior crunching along with it. I’m not sure if this was intended along with the design of the Kiss, but it’s very nice, regardless. These are worth checking out if you’re a fan of malt and they do deliver the delicious flavor they claim. All I can say is if they keep producing a few home run flavors like this one, I’m gonna be really sad when Hershey stops making so many limited editions due to the year 100th anniversary of Kisses ending. Darn, I would have *loved* one with a marshmallow center! Thanks for the review – now I know to avoid them :( The malt ones I might have to give a try though! I thought the marshmallow ones tasted like fudge. where did you buy the malt ones i havent seen them anywhere. I haven’t seen either of these.. but I *need* the Malt ones, especially after your good review! I’ll try the malt but not marshmallow ones–thanks for the review! P.S. I’m now making Walgreen’s the first stop on my errand running tomorrow to search for these little malted delights! 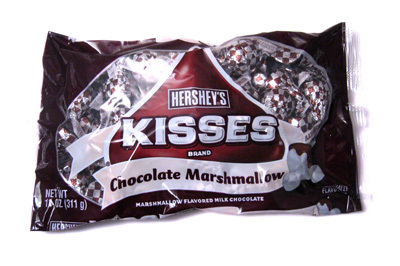 I have a basket of kisses of so many flavors, I still think to this day my favorite is white chocolate with peppermint stick shavings. I will have to go out and find these Malt Kisses of which you speak of. They sounds delicious. I found the malt crunch ones at KMart today, so there’s still some floating around out there! Kmart had about thirty bags of the malt ones in my area.